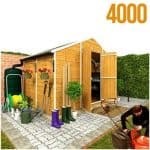 This single door shed measures 8 x 6, and is an attractive building to have in your garden. 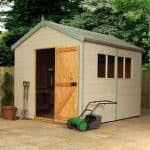 There are plenty of features attached to the shed that make it a worthwhile purchase, but one of the best things about it is the tongue and groove cladding that runs throughout. This is shiplap cladding, and is very effective in preventing rain water from entering the building and causing damage. 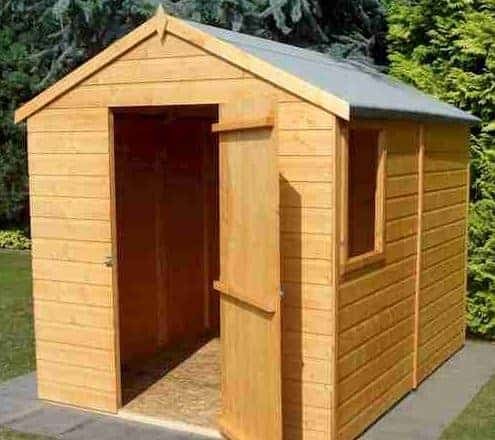 The single door opens wide and allows easy access to the building, and there is also plenty of scope for a long life shed here, with a free basecoat treatment included to make the durability of the shed a real feature. OSB floor and roof. Though the manufacturer marks this as a benefit, it really only offers cost-saving benefits. The floor isn’t strong so if you store a lot of heavy equipment you will end up damaging it over time. The Shire Apex Durham single door shed has a very distinct design that makes it stand out from traditional sheds. Though it comes in a medium size, it provides a surprisingly large amount of storage space within its interior. It is a tall building, though like some of the other sheds in the Shire collection, the Durham has a very short door height. Even if you’re of average height, you’ll need to duck quite a bit to enter the building. Once inside however you are treated to a fantastic amount of headroom thanks to the style of the apex roof. This shed benefits from a simplistic apex roof design. Commonly used by manufacturers, this roof offers fabulous weatherproof benefits. Largely, it directs rainwater down the roof and directs it towards the floor, rather than the walls of the building. To boost this protection Shed Store have also covered it with mineral felt. The height of the building is also thanks to the roof design. It is very spacious inside, particularly in the central part of the shed. So if you’re going to want to store anything tall, this is an excellent shed to opt for. Though both the roof and the floor are made from cost saving OSB materials, they are slightly thicker than some competitor sheds. If you do a little research, you’ll discover that the average OSB roof measures 8mm thick, whilst the floor measures 10mm. With this shed these measurements are slightly enhanced, with both measuring 11mm thick. However, we’d still advise against using the floor to store anything heavy. We love the distinctive look of this shed. Although it isn’t uncommon for a shed in this collection to feature Shiplap Cladding, it is uncommon to see such a defined style. You’ll notice that what really stands out with this cladding style is the channel added between the timber panels. It forms an indentation which is used to catch falling rainwater, before channelling it away from the shed. This means the shed has a more effective defence against the elements than overlap buildings. Inside the frame is also a little sturdier than average, measuring a great 34mm x 34mm. This robust design means this building is capable of withstanding strong winds and heavy downpours. One thing we like about Shed Store is the fact they often provide some form of free treatment. This one has been given a basecoat treatment. It’s basically designed to ensure the timber doesn’t warp or damage during transit. It is still advised to treat the shed once you’ve put it together and then continue to treat it annually for long term protection. Though it’s hard to tell from the picture, the single door on this shed measures just 5’3” in height. That’s shorter than the average person and will therefore require you to duck as you enter. This might not be a particularly major issue, but it’s still worth taking into account before you buy the shed. It does benefit from a very slightly wider than average build which makes transporting all kinds of storage a piece of cake. It comes with a pad bolt fitted and a complete 3 hinge design. The pad bolt is worth mentioning as it has a much stronger construction than the majority of pad bolts found on lower cost sheds. The three hinges will also ensure it won’t sag as time goes by. The glass window has a tall design and it can be placed on the right or the left side of the shed. Being able to choose where it is located is a great benefit and it adds to the building’s convenience. You can also open the window which is beneficial in hot weather as it will adequately ventilate the interior. As it is sold, the shed is neither very secure nor private. It does have the benefit of thicker, stronger walls than overlap buildings. However, with no padlock included a thief could literally just walk right in. The window also isn’t covered and with its tall design it is easy to peer through and see everything inside the shed. Thankfully it is pretty simple to rectify both of these issues. A strong padlock will add excellent security, whilst adding a window covering such as a blind will make it more private. The shed’s modular design isn’t just useful for easy handling, it also gives you the opportunity to change the position of the window. You can install it as it is shown in the picture, or move it to the opposite side of the building. The benefit of doing this isn’t just a case of personal preference, it can also help with privacy if one side of the garden is more closed off to passers-by than the other. You can choose to assemble the window on the most private side. A Wooden Base with Adjustable Spikes is also available as an extra. We’d always recommend buying a solid base if you don’t have concrete to erect the shed on top of. 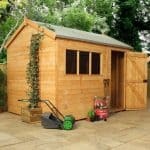 Without an even and firm base, the shed could suffer from stability issues and this could compromise its longevity. This base isn’t the most advanced, but the adjustable ground spikes are a nice touch. They basically make sure the base is attached firmly to the ground below, adding maximum stability. 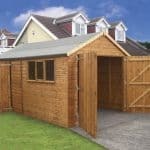 A base will also make the construction of the shed much quicker and simpler. We’d have loved to have given this a higher quality rating due to its exceptional distinctive design. However, the interior solid sheet construction and unbraced door do let it down a little. Overall though for the cost it is a great quality building with rigid exterior walls. Whilst the door is unbraced, the three hinges will prevent sagging so this increases its longevity. The exterior walls are also incredibly hardy. 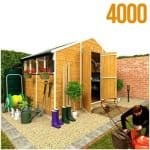 With regular maintenance as instructed, this is a very long lasting shed. 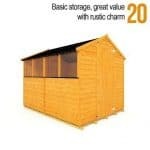 Although considered a medium size storage shed, you’re given a large amount of space to store all kinds of belongings. As you are also able to add shelves and hooks, the storage potential is incredible. The manufacturers have built this shed with a modular design so that it is easier to handle. However, some customers feel that the instructions aren’t overly clear. In particular the roof is a little tricky to install correctly. It is very important to ensure the door is properly aligned before you fit the roof. Assembly time isn’t bad however, estimating around 2-4 hours. We would like to have seen better quality materials used for the floor, but overall we’re happy with the value for money provided. The amount of space you receive and the low initial cost, along with the Shiplap cladding make this one of the better value sheds in the Shire range. Final Thoughts: It isn’t hard to see why this is one of the highest rated Shire sheds. The Durham has a superb look. On the outside it benefits from a very strong, rigid and smooth design. On the inside however we do feel a bit let down by the solid sheet floor and roof. Whilst it won’t pose a problem for the roof, it will restrict the weight of your storage. On the whole though we love this shed. The tall styrene glazed window provides good lighting and is also shatterproof for safety purposes. Though it has been given a basecoat treatment, for long term protection it is recommended you treat the timber again with a high quality preservative after assembly.